N729CK (cn 22982) A good day for some cargo classics. N729CK (cn 22982) Another one from the archives. This Kalitta B727F was caught on the South Freight Pad. USA - Ohio, July 3, 2013 Chuck Slusarczyk Jr.
N729CK (cn 22982) Way off in the distance and distorted by heat haze, it was still cool to catch a shot of a 727 at CLE again. Once so popular at CLE and now that FedEx has retired theirs, it will be even harder to catch any 727's at all. 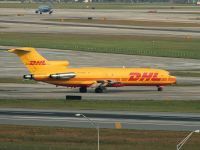 This aircraft last flew with the now defunct DHL as N751DH, and had a long career in the Middle-East before that. Now sporting winglets, this is the second 727 to wear this registration for Kalitta and is pictured parked on the south cargo ramp on a hot and humid July afternoon. N751DH (cn 22982) DHL Cargo 727-200 N751DH is seen at ATL June 10, 2006. USA - Florida, February 23, 2005 Chuck Slusarczyk Jr.
HP-1310DAE (cn 20894) With eight 727's, a 737, and a DC-8 already parked at Cargo City, this Aero Expreso example taxies around the blast fence to join them in this view from across the Dolphin Expressway. USA - Florida, March 9, 2010 Chuck Slusarczyk Jr.
HP-1610DAE (cn 20780) Arriving from Panama City, Panama (PTY). HP-1510DAE (cn 20709) DHL (DHL Aero Expreso, S.A.) 727-200 HP-1510DAE is seen at MIA February 14, 2008.